Ride and watch two of cycling’s greatest races! 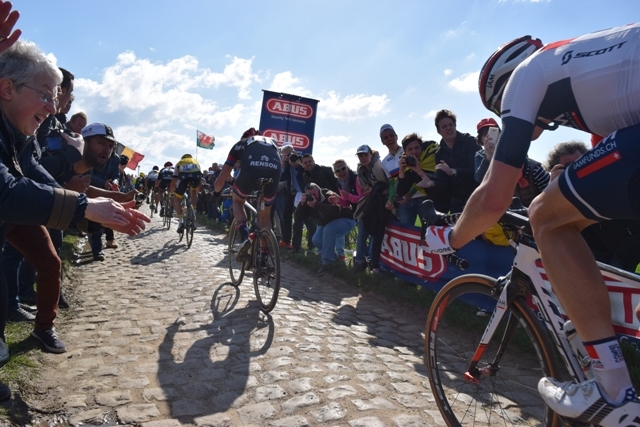 The Tour of Flanders and Paris-Roubaix make up the heart of the cobbled classics and we are headed back for another round this April. While you may think a cobble is a cobble, we can assure you that the cobbles and the two races are very different. Flanders cobbles are a bit more “mechanical” in their placement – usually a consistent width and size, they still pack a punch, especially when paired with the feared hills the most ramous reside on. Roubaix cobbles, by comparison, are much more ancient feeling. They are more gnarled and disparate, more uneven and treacherous. The technique of riding them is similar – go as fast as you can manage and hope it lasts the whole sector! We’ve got full trip information and registration available under our Trips page – drop by and take a look, you may well want to join us! 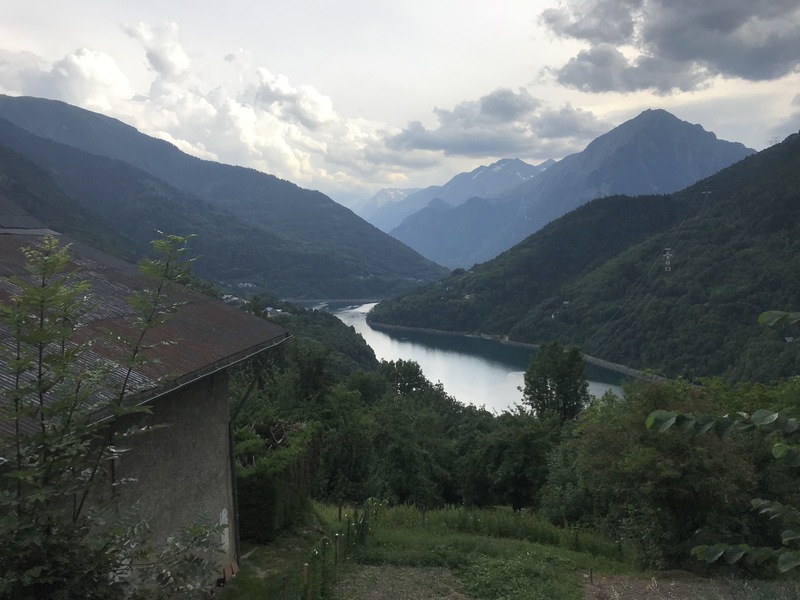 I caught the TGV from Paris to Grenoble on Tuesday July 17th, grabbed the rental car and headed to my AirBnB near Bourg d’Oisans, right at the base of Alpe d’Huez. After settling in I headed out to explore a bit. My first ride was a little exploration of some small roads around the valley. 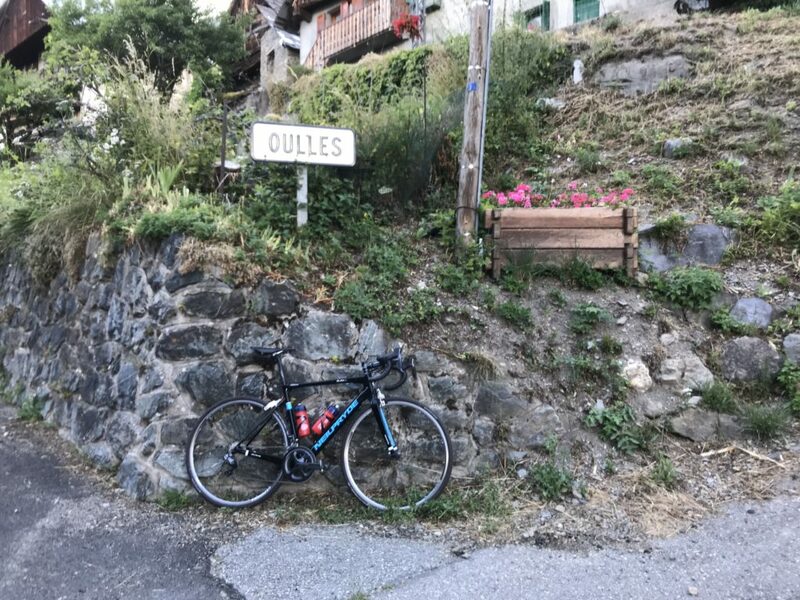 It was short and sweet including the twisty, steep, and superbly quiet climb to the small town of Oulles (6Km at 10% gaining 1,963 feet). From here you can see much of the valley and the road to Alp d’Huez directly across the way. 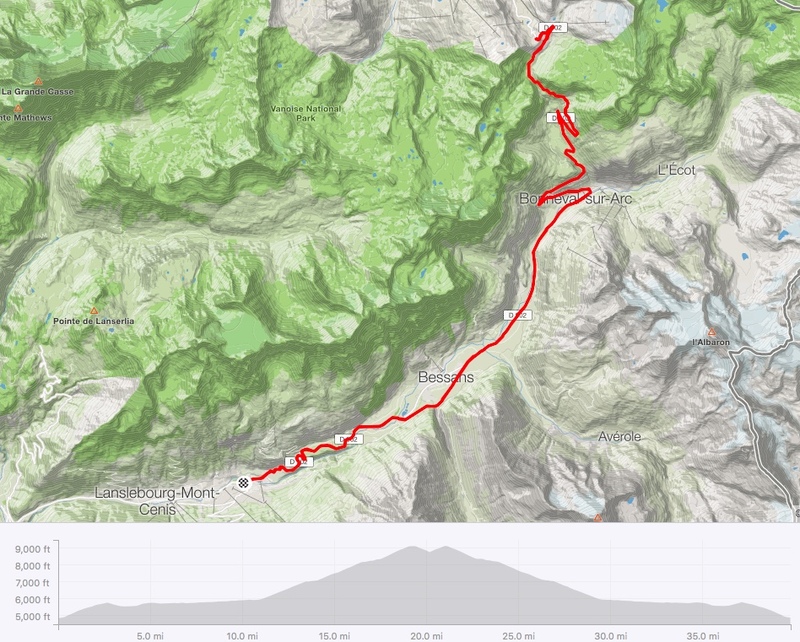 I then rode up the D526, a fairly easy road, to my first pass the Col Ornon (6Km at 5%), and then back to Bourg d’Oisans for some dinner after looking at the first couple of switchbacks on Alp d’Huez. Tiring, especially given the travel, but a nice first ride and a great dinner! 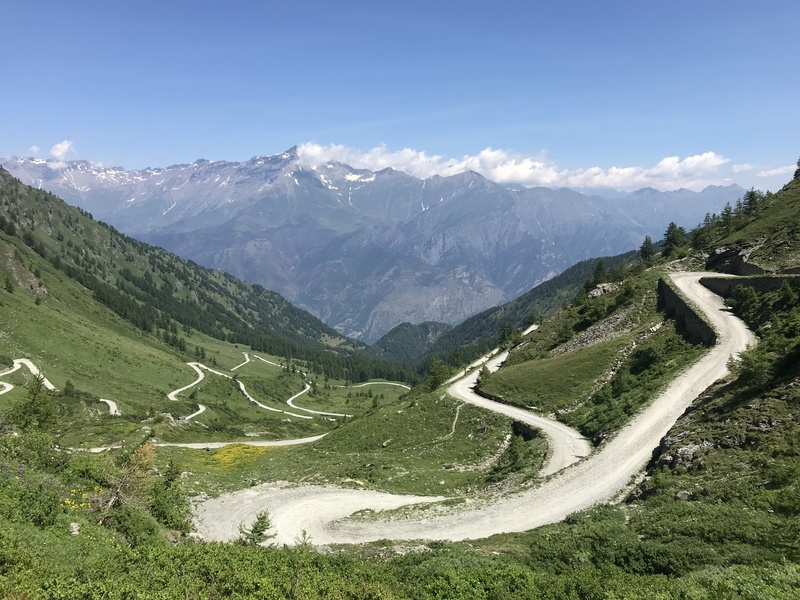 The next morning I got up early to drive to Susa, Italy and the infamous Colle delle Finestre climb that played such a huge role in this years Giro d’Italia. 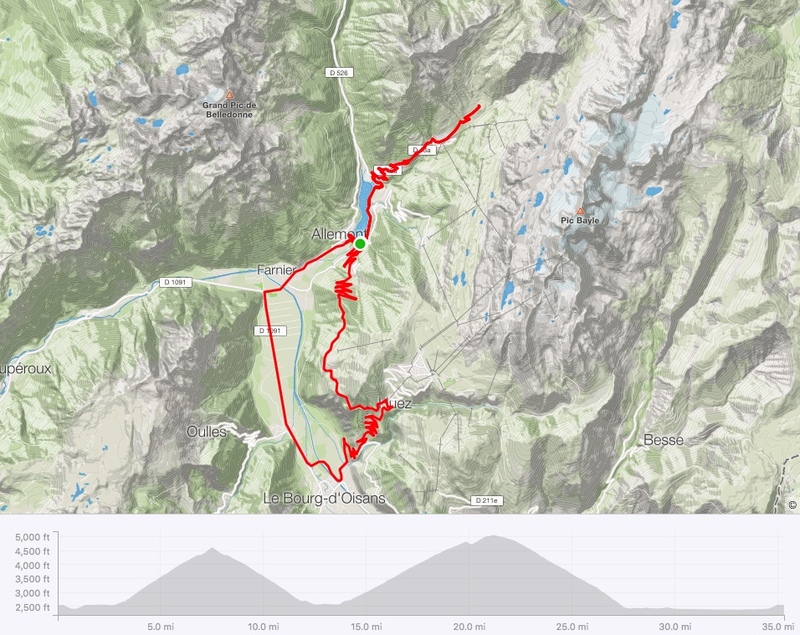 I parked up valley in the little town of Sauze d’Oulx, 20Km or so from Susa for a leisurely downhill warm up, grabbed an espresso and croissant in town and then hit the climb itself. It’s only 19Km (11.1mi) or so to the top, but it is an impressive 19Km! The first 10Km are an unrelenting 9% average as you twist and turn your way thru 15-20 switchbacks hidden amongst trees. From time to time you get a great view back down to Susa for a reality check of just how far you’ve already come. There is a great little church about 1/2 way up that has a much needed water spout for a refill. Shortly after the church the road turns to dirt for the remaining 9Km. The grade remains in the 9% range all the way up and my 36×30 was probably enough gear for a well rested rider. Given my hectic travel schedule I was anything but well rested and prepared. 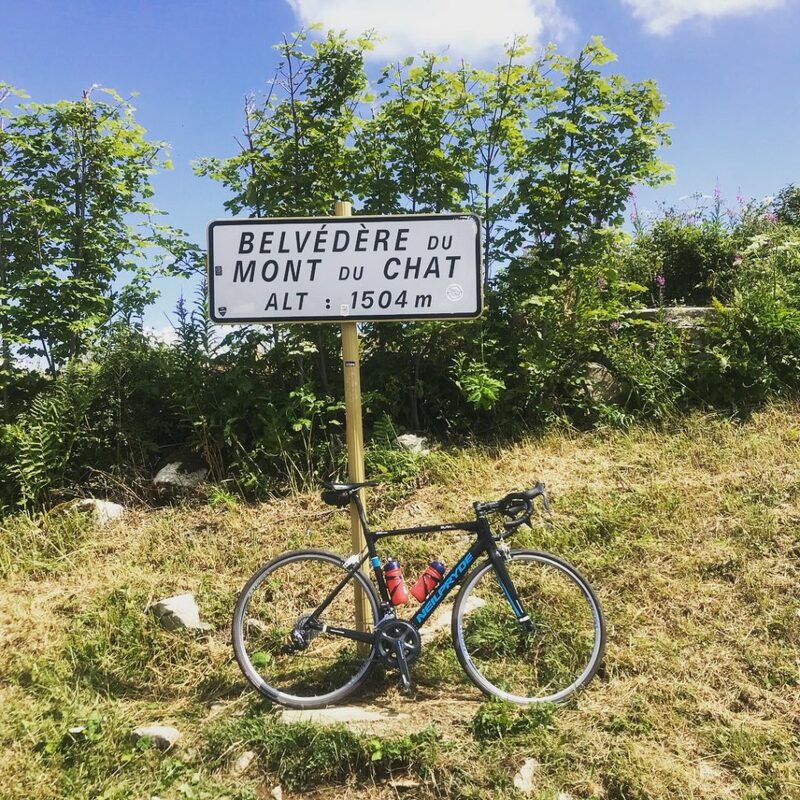 A week of not riding (the ultimate taper!) and 30 hours of travel and awkward sleeping arrangements had left me a little more tired than I expected so I was pretty slow (224Wavg @5mph)! Still, the thrill of reaching the top and snapping some photos was immense. 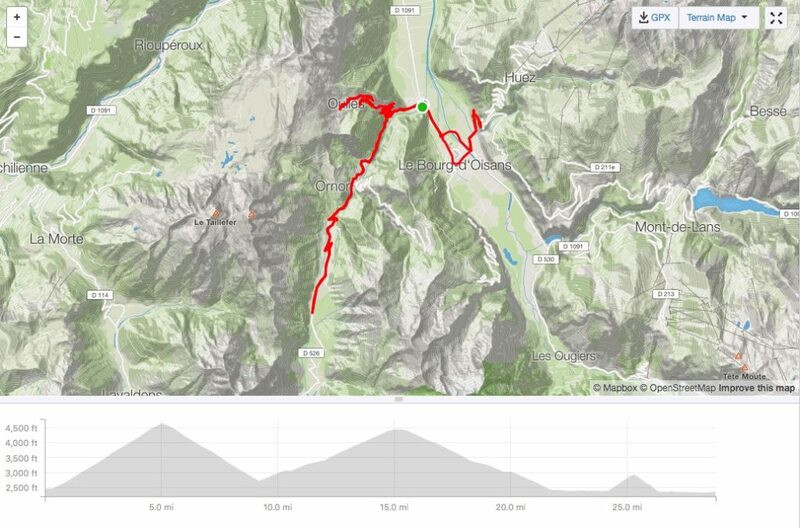 Then I dropped down the other side and headed for the “easy” 8Km climb to Sestriere. My greatest piece of advice on this ride is to be well rested and don’t forget to EAT, a lot! I didn’t and suffered mightily on the Sestriere climb, ultimately having to stop for 10 minutes when the cramps set in. Once they subsided I was back at it for the last 2Km to the top. I was so cooked that I had to walk back uphill a few hundred meters, stopping along the way to hurl a time or two, in order to get some food. A delicious looking hamburger simply did not sit well after one bite, so I made do with a simple coke and set out for the return drop to the car, which was picturesque and fun. Watch A Video With My New Friends! Shelled, sore and fatigued I awoke to race day at the Tour de France, hauled myself our of bed and headed for our collective cycling mecca. The climb itself is tough, throw in a couple hundred thousand fans, a slew of team support vehicles, and an overly sore athlete and it makes for a bit of a challenge. I rode up about 4Km to La Garde where a sweet little road wanders off to the right and quickly becomes a narrow jaunt along a cliff wall, stunning! A couple of short tunnels and an easy grade make this a worthwhile option if you have the time. From there I returned to the main climb and made my way to the top. Lots of photo stops, lots of people, and barriers starting 4Km from the finish meant that I ended up watching the race go buy at turn 4, about 3Km from the finish. I have to say that the race itself was a bit anticlimactic for me. It is just another bike race after all. We were delayed 30 minutes or so in starting the descent so team vehicles could get riders down first, but were rewarded with a pretty fun descent amongst thinner crowds. Watch This Cool Little Cliff Video! After a bit of rest I was ready for the next challenge. A rental car disaster kept me off the bike until nearly 6pm, but one really great part of riding in July in France is that it doesn’t get dark until after 9pm every night! The air was cool, the sky was gorgeous and I was feeling nearly normal again so I set off to climb the Col du Sabot. Rolling along the start of the Croix de Fer I could see rain clouds forming farther up the pass. Fortunately my route took me to the next valley over and I had a dry ride throughout! The climb itself is perhaps the most beautiful climb in the World! Ok, that may be a stretch but nice pavement, a consistently hard grade, and a series of small villages perched on the mountain side, made for a truly memorable experience. I rode about 8Km up to the village of La Collette, which is about 1/2 way up the Sabot. 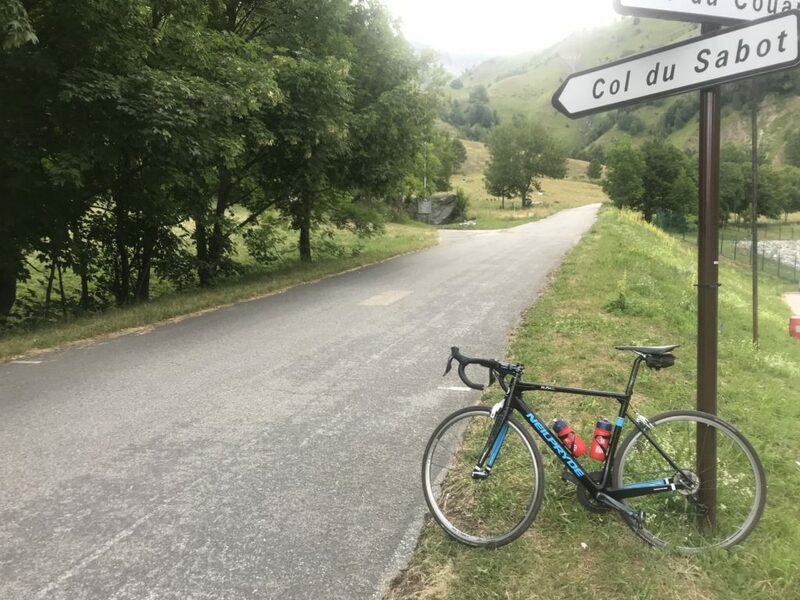 The weather higher up looked a little dicey so I decided to descend and ride another nearby route, the Col de la Confession. 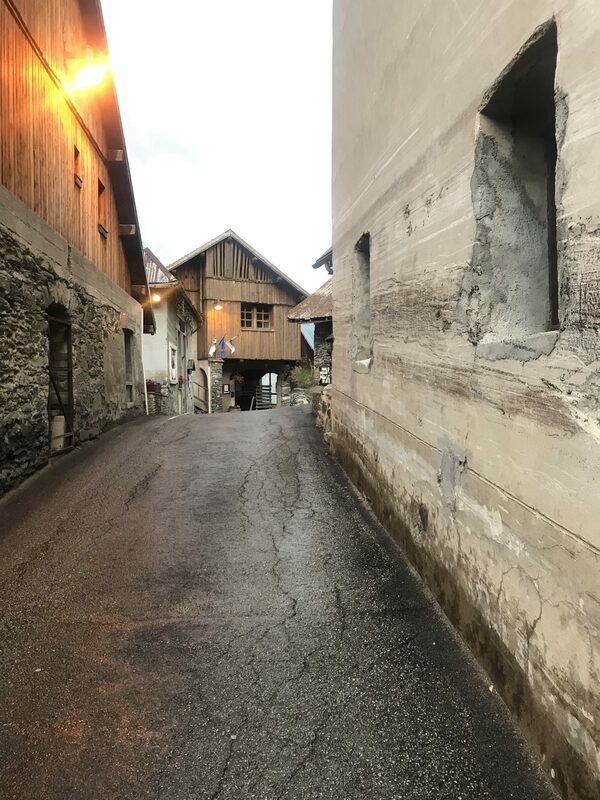 This great little road winds up the mountain to Villard Reculas, another of the story book villages dotting the mountains in the area. The road narrows above the town and continue to the top of the pass before a great little descent to the village of Huez just above the infamous “Dutch Corner.” By this time it was after 8pm and I was rewarded with a nearly empty road for the descent back to Bourg d’Oisans. It is amazing to me that on a Saturday night, a mere two days after the Tour de France has passed, I had the whole of the road as my private playground for a few minutes, awesome! 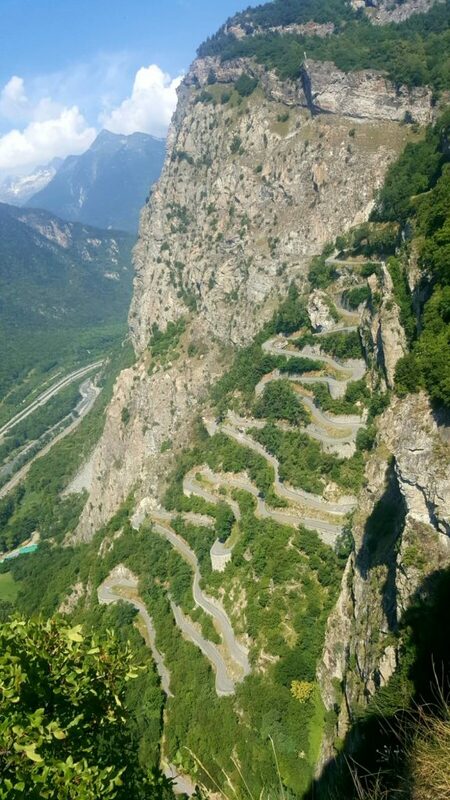 I first saw this amazing road while watching the 2017 Criterium du Dauphine and knew I wanted to ride it. Further research noted that it is one several lists of France’s “best climbs” and my mind was set. 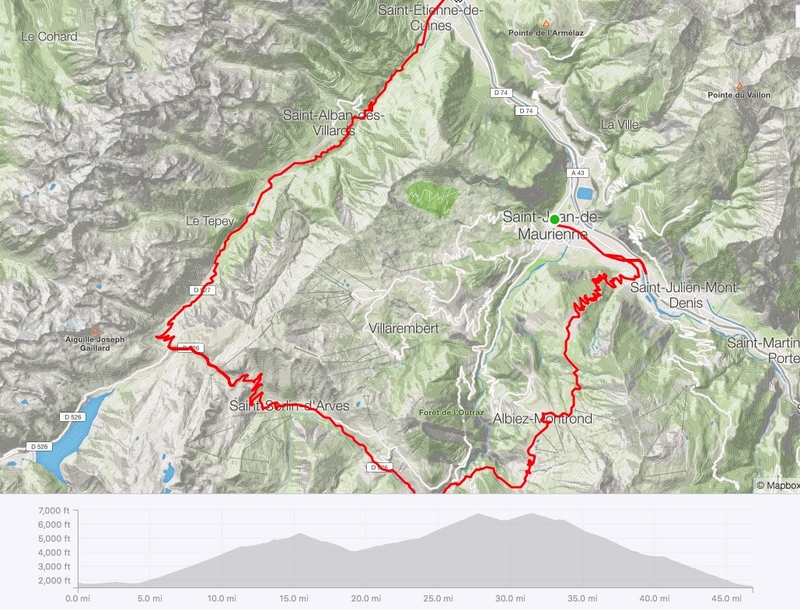 I have to say that I was a bit intimidated by the climbs and abandoned my previously built Strava ride that was some 80 miles and 10,000 feet of climbing, opting instead to head straight to the main course. What a course it is! 8 kilometers at 10% average grade is exactly as hard as it sounds. The road is a heavier pavement, but generally smooth and predictable both up and down. There was an excess of traffic going up and down so you had to keep your wits about you lest you end up on the front of a fast moving moto or car! The climb took just over an hour and includes 10 switchbacks and about a thousand other little turns that make the descent fun, and sometimes nerve wracking. It was easy to spot the turn where Richie Porte flipped himself out of the race about 2Km into the 15min descent (I might have stopped a time or two for pictures). Difficult and great! 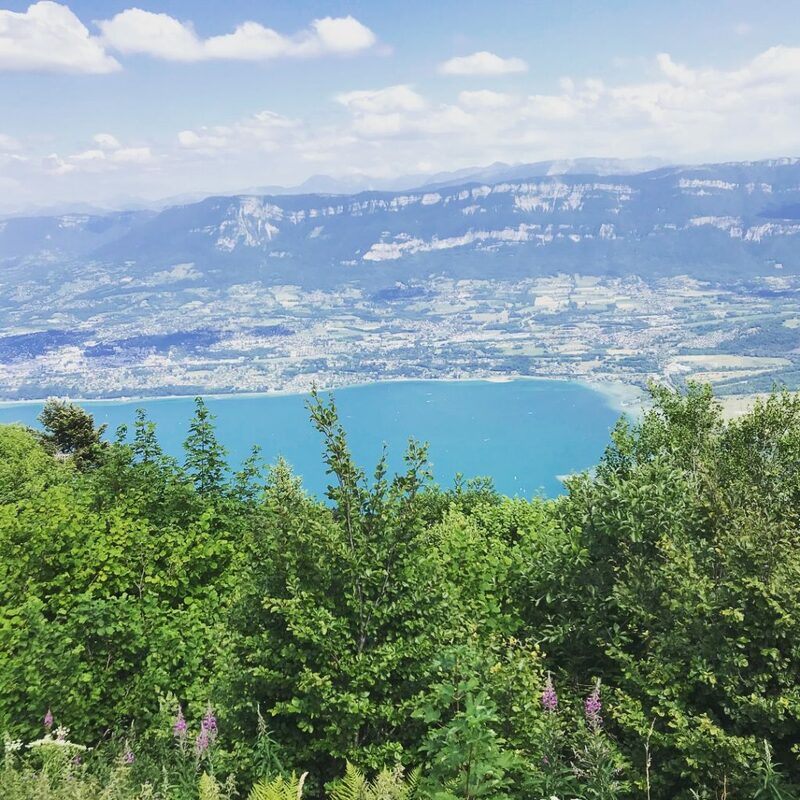 From there I drove to Annecy to pick up my riding buddy Yuwen who would spend the rest of the trip exploring with me. We awoke the next day for a quick breakfast before heading out to find a rental bike for Yuwen so we could ride around the lake. Once we hit the bottom of the lake we couldn’t help but tackle the nearby Col de Forclaz – I mean why not, right? The climb was the easiest so far, although in fairness I did it on my 16lb Neil Pryde race bike while Yuwen tackled it on a 35+ pound hybrid, so we know who the real champion of the day is! From the top the views of the lake were stupendous, punctuated by the overhead flights of dozens of people parapenting their way off the mountain. 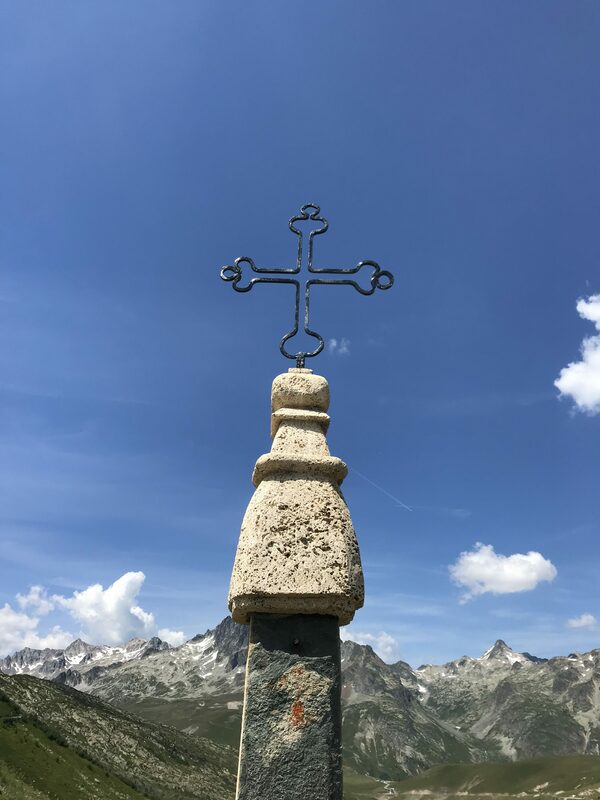 The next day we headed up to La Clusaz to tackle a small version of the Col des Aravais, a classic little climb up to a gorgeous summit, peaked by a small church and stunning mountains all around. You’ve seen the pictures and wanted to ride it. Iconic and gorgeous the “laces” of Montvernier were part of this years Tour and simply look amazing! 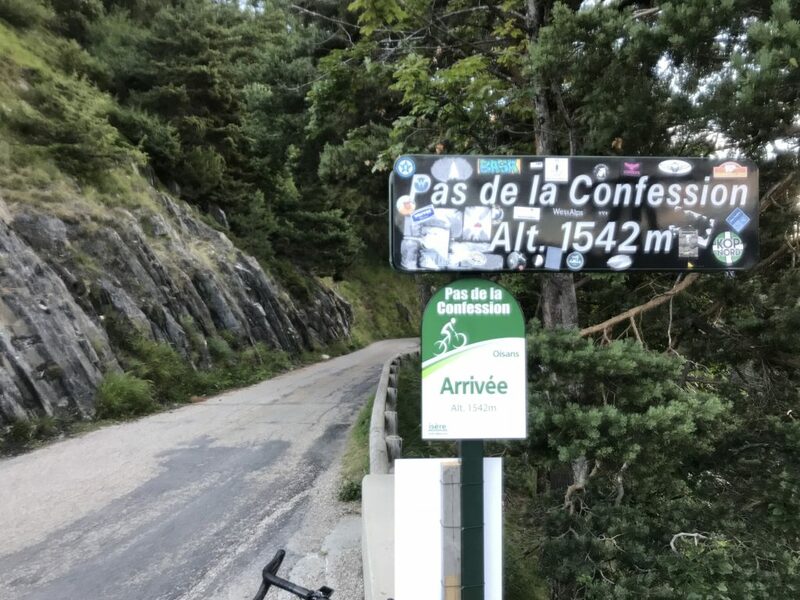 The secret benefit is that they are merely the starting point to a really great climb called the Col du Chaussey, which continues up another 10Km at 8% for 2,438 feet of elevation. 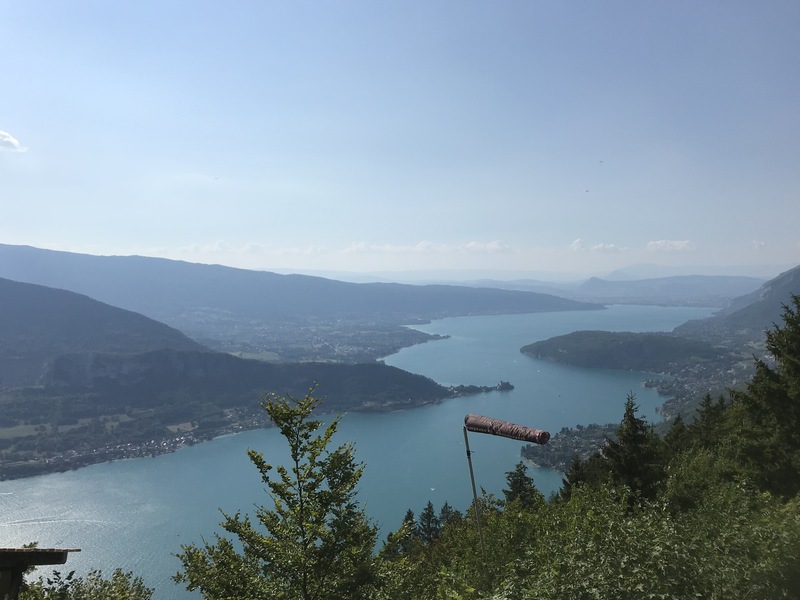 Some killer views and cute little villages along the way led to the summit where we had a well earned Coke and conversation with a couple of Belgian guys before descending back to our base in Saint Jean du Maruienne. Good day. The second really big ride of the trip. 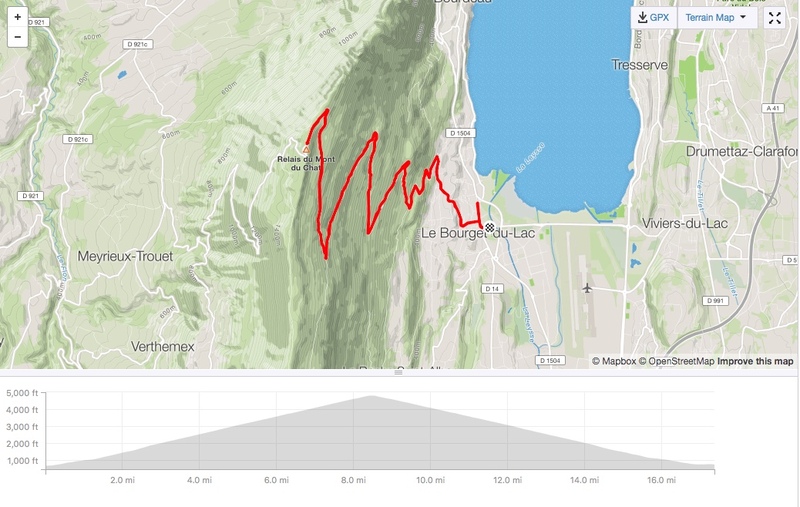 34Km to the top if you include the Col du Telegraphe. Pretty cool climbing, though not much to see on Telegraphe. 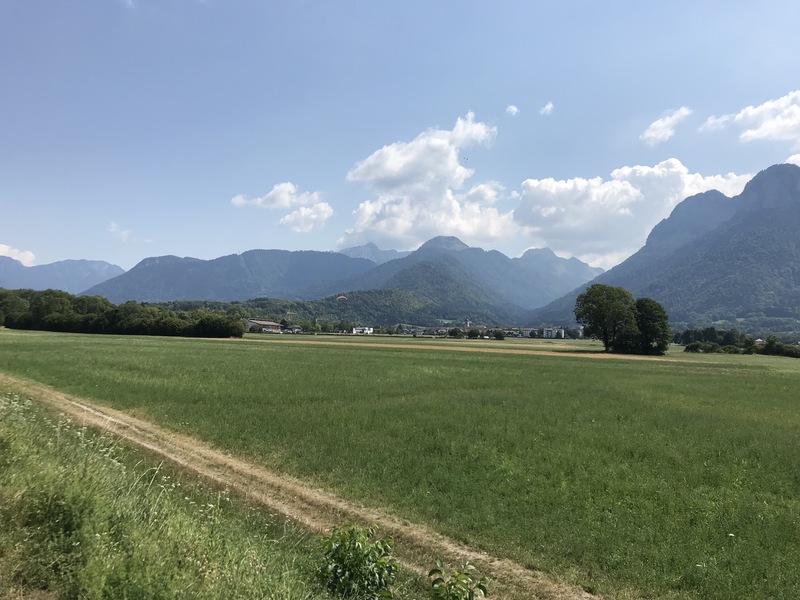 After a 5Km descent, you then roll along up the valley as you leave Valoire for about 10Km before a right turn over a small bridge and the real action starts. The final 8Km or so are quite a bit tougher, the more so as altitude gets mixed in, but so gorgeous to just stop and take in the views. Tons of cyclists on the route both ways along with a host of cars, campers and motos, each looking for the thrill of the summit. The final kilometer up from the tunnel is just grand! Felt good and strong finally. I rode back down to the tunnel so I could come up the last kilometer with my riding buddy Yuwen, who did awesome! The descent is a blast with good predictable and fun corners on the upper section and fast, mostly straight roads back into Valoire. An epic day! 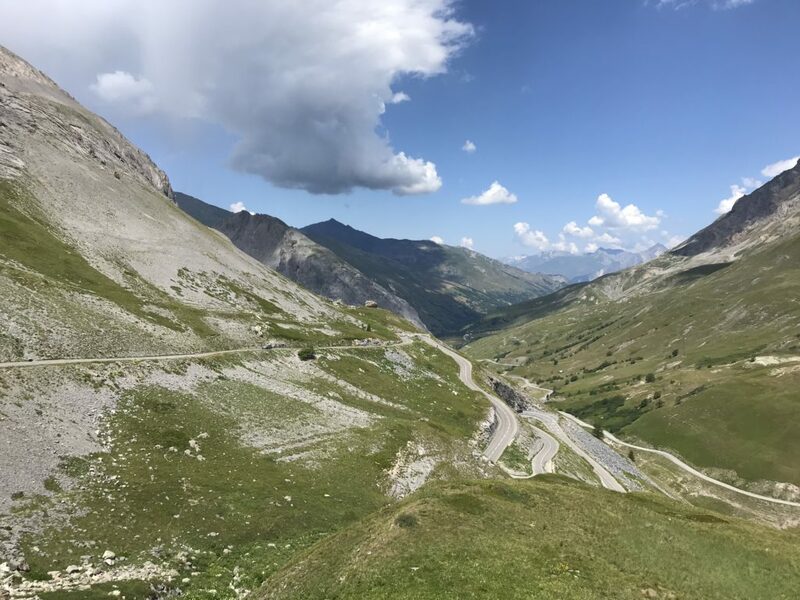 The Croix de Fer has been my self-described “favorite” climb in the Tour de France for quite some time. 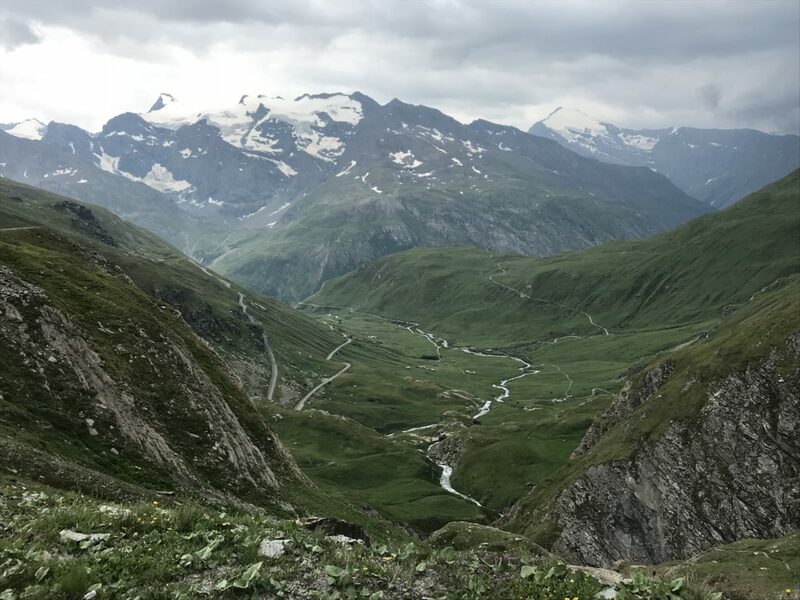 The images of the field crossing the summit, the massive crowds, the narrow roads, it just seemed like heaven to me, the quintessential Alpine Col. Then I heard about the Col du Mollard option from the awesome Cycling-Challenge website and knew that was my path to the Iron Cross! I started from the downtown apartment we had, rolling easily to the base of the climb in Villargondran and immediately started going up! 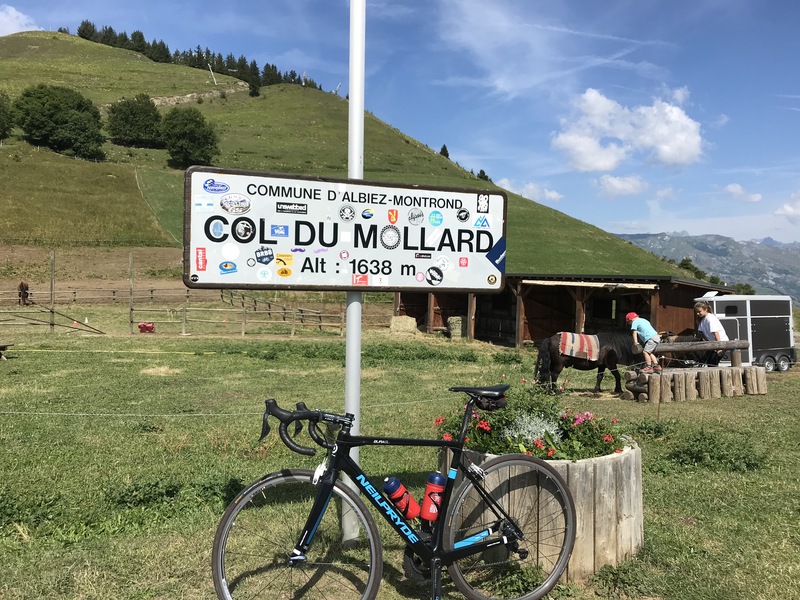 Col du Mollard has about 40 switchbacks in the first 10Km and runs up just over 3,300 feet in 11 miles to arrive at the gorgeous ski town of Albiez Montrond. I stopped for a much needed espresso and Nutella Crepe before the quick drop to Belleville and the last 15 kilometers of the Croix de Fer. I knew it was 15Km, and I knew I wanted to hit it pretty hard. We’d driven down the pass a couple of days earlier in a gorgeous rain storm while driving back from a recon of Bourg d’Oisans/Alpe d’Huez. It was treacherous and thrilling to drive down the narrow roads trying to take in the epic nature of what was to come. The left turn onto the D926 started out blissfully modest and I stepped on the gas, aiming to average 250W for the remainder. 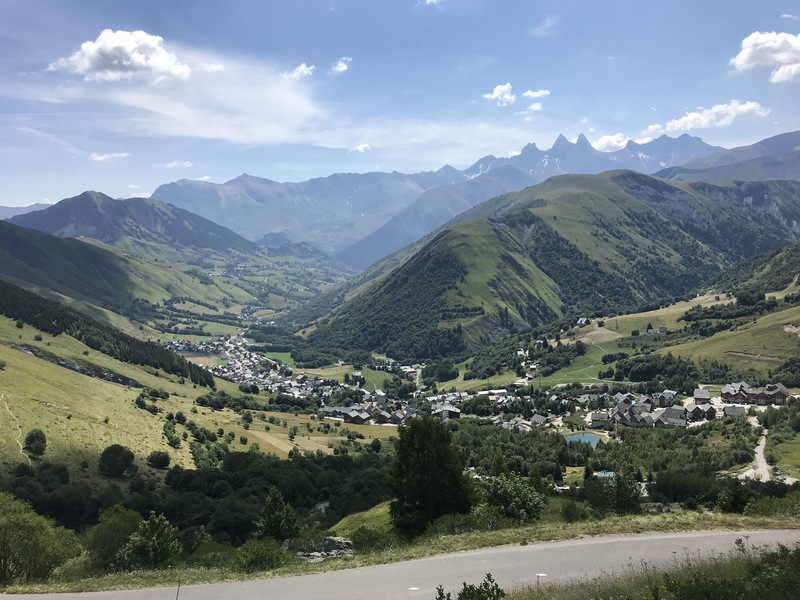 Like many Alpine climbs the Croix de Fer rolls up a long valley before starting a final, brutal, ascent to the summit. 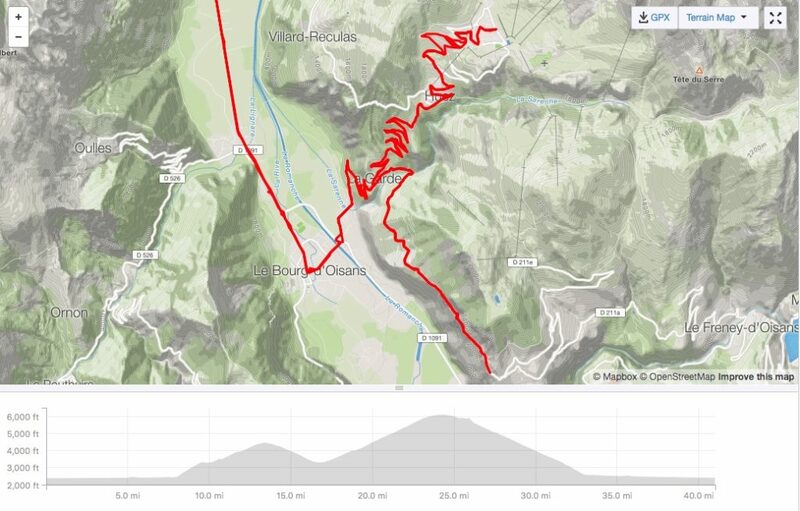 In this case it was 7.5Km of 4% before I hit the village of Saint-Sorlin d’Arves and the final 7Km averaging 9%. I felt great and only made one quick stop to grab some water in town before heading up. It was everything I’d hoped. Narrow and pock marked pavement winding skyward to the next switchback it was a dream climb. From the top it is a mere 2.5 kilometers over to the summit of the Col du Glandon, another infamous climb in the region. Yuwen rode up the Glandon and with the luck of lovers we met at the summit within a few minutes of each other, then headed back to the top of the Croix de Fer before descending the Glandon back to the car. The descent was the best one of the whole trip. It starts off steep and then softens slightly making for fast and fun turn upon turn upon turn. All variety of turn strung together on perfect pavement in glorious sun as we dropped 20 kilometers and 4,600 feet to the valley below, enjoying ever moment. The Galibier/Telegraphe and Croix de Fer/Mollard climbs really served to whet the appetite so we made a spur of the moment decision and bagged our return train to Paris the next day, instead heading to Lanslebourg so we could climb the Col d’Iseran, the highest paved pass in Europe, and it was a really great decision! From the accommodations (a little one room ski chalet) to probably the best dinner of the whole trip, we enjoyed the experience immensely. That’s not to say it wasn’t difficult. At over 9,000 feet in elevation it was a solid challenge to climb. 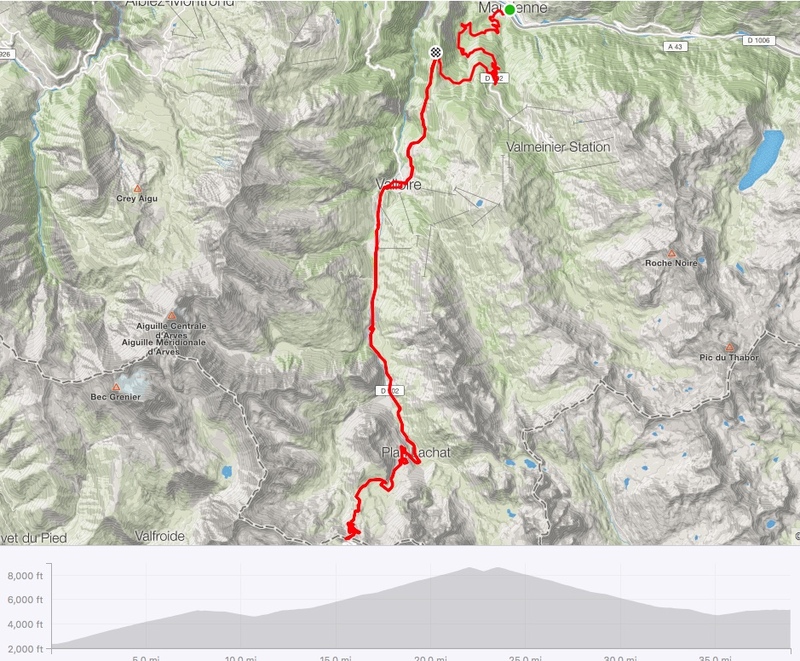 The ride started with an ascent of the petite Col de la Madeline, 2 miles at 8% to get the sweat rolling. Then it was a leisurely ride to the base of the real climb, the final 14Km to the summit. It was a challenging ride, despite the relatively short distance and modest altitude gain. The descent, however, was the real thrill. Shortly after leaving the summit we could see the rain clouds rolling into the valley below and knew that it was going to get to us shortly. Sure enough about 5Km from the bottom we got hit with a driving wind and rain that immediately chilled thru my light rain jacket. The wind tried several times to blow me off the bike and Yuwen, several kilometers behind me and moving cautiously on wet roads, was forced to seek refuge in one of the high alpine huts used by ranchers tending herds in years gone by. She was rescued by a great Italian family while I raced ahead to get the car! 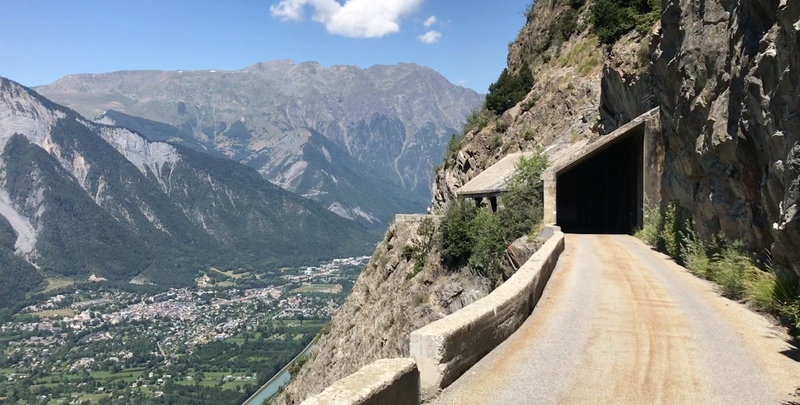 It was a truly huge end to the day and a warm lunch in Bonneval Sur-Arc at the base of the main climb helped get our body temperatures back to normal for the drive to Grenoble and our waiting train. Last week at the Tour of Qatar, Team Katusha offered viewers a day to day primer on the value of a solid team plan executed to perfection, netting 3 stage wins in the process. Read on to learn how you and your teammates can begin to emulate the sort of selfless racing on display by the big dogs. The pros live and breathe by the fact that cycling is a team sport, with each rider doing what is best to accomplish the goals of the team. Unfortunately, in the amateur realm this sort of effective execution is at best hit or miss, and more often than not completely missing. This may seem completely rudimentary, but having a thorough race plan is the first step to success. Far too often riders arrive at the start line with no idea of who is the team leader and what sort of help is needed, much less an idea of what “help” really means. Here is an interesting caveat to the above statement – it is surprisingly common for everyone on the squad to default to a helper/domestique role! This may seem counter to the common (mis)conception that most riders are really in it for themselves and don’t want to work for others, but in my experience it usually works the other way. Offering your services to the team is selfless and frankly, it is far easier to offload the pressure and responsibility of being “the guy (or gal)” and instead accept some largely undefined role as a domestique for the day. In contrast, I challenge each of my team riders (and you) to take on the mantle of responsibility at least once each season, especially in the lower categories. It is an essential part of learning to be a complete racer and forces the rider to step up their game and deal with the stress of responsibility. Once you have an idea of who the leader is, you can start sorting out what they will need to be successful. Are they good at positioning themselves near the front? If not, who can best help them do that? Who is going to carry an extra water bottle or rice cake so the leader doesn’t have to? I like to assign at least one, often two riders to act as sole support for the team leader. These riders should all be very familiar with one another and able to instantly identify a need, meet that need and move the team plan forward. To that I add a road captain – someone on the squad who has shown themselves astute at reading a race and more importantly moving around the field to marshal assets to the task at hand. From there we assign roles to the remaining riders based on their abilities and fitness. Here is where the meat and potatoes work of planning comes into play. Often an amateur domestique will indeed think of themselves over the team needs. Not so much for their individual result or a win, but rather in their willingness to sacrifice themselves completely to the altar of team success versus a desire to not get dropped from the raging peloton. Ego is funny that way. So one key element is to carefully create and assign roles to riders so that they feel a sense of responsibility AND a sense of accomplishment at completing their assigned task. If one of my riders is asked to ride tempo on the front for the first two laps of a 10 km course hard enough to dissuade attacks, I expect them to arrive at the 20 km mark largely destroyed and unable to further contribute to the teams plan. That leadout guy who’s supposed to drop the sprinter off at 200m – his finish line is at 200 m and he should ride as such. Doing a hard leadout at 28 mph is not doing your job – you need to take it to 32 mph or more to create the kind of pressure that stretches the field and allows the rider safely attached to your rear wheel to thrive in a diminishing field of challengers. So what is the key to creating this kind of buy in? Early planning and a consistent post-mortem on the race are two key aspects that are often overlooked or under-utilized. To meet this goal I use both a pre-race planning sheet and a post-race report that is standardized and assigns tasks and grades to each rider. Don’t let the post race meeting turn into a complaint session where everyone takes shots at each other for not doing “their job” – no, this is a team effort and each rider must put ego on the shelf and be open to the critique and criticisms on offer from those in the fray, and accountable for their contributions and missed opportunities. One of the teams I coach has gone so far as to make these forms available online well ahead of the race so we have a living document of ideas that simply need a final version, as well as an instant database of each seasons racing. It’s very handy! A good first step in creating a viable plan is to look at how the race played out in the past, and how your team in particular performed. Has the race been run on the same course for the last 10 years and always come down to a field sprint? Building a plan where your guy solos off the front from half distance is probably a losing proposition. Has there been a break-away each of the last few years? Why and where did it go? These snapshots of previous events can help form the template of what might work for you and your team. Subsequent to that, look at the course itself. What is the defining characteristic of the race or the course itself? What obstacles are presented? Once you have a course and event profile, take it a step deeper. Where is the wind on the finish? Is there a particular landmark or course component that gives rise to an attack, or a nefarious corner that has seen mayhem time and again? How can you use this recon to your advantage? If possible, I like to have my riders pre-ride particularly important race courses to see what changes the road may have undergone. Perhaps your favorite corner has been repaved and is now far less intimidating. Maybe what was a killer climb last year is now a mere bump because you and your team are fitter and more prepared. What gives you the advantage? Find it and build around it. Team tactics in amateur racing are too often all talk and no action. Riders meet up before the start and hatch together an on-the-fly plan that has no background or thought put into it save the classic “who feels strong today?” Why don’t you help take your team to the next level by creating a comprehensive race plan for your next outing? There are some fundamentals to that task; namely knowing who you have available for the race, what their capabilities are, what the course profile is and where the opportunities lie for your team. To that you should add an almost obsessive amount of detail about who is to do what and when so as to create buy in from the other riders that their contribution to the greater good is worth not making the final selection. When I was in ninth grade I lived in a little tiny town in Southern Colorado. La Veta was all of 600 people, zero stoplights and only a couple of paved streets. It sits at the base of the Wahatoya, two 13,000 foot peaks just south of town. We played 8-man football against teams like Simla, Sierra Grande, and Aguilar. Most everyone played both ways. I was the 105 pound freshman running back and defensive end who was mostly used as fodder for the varsity on practice days. Wrestling was a better fit and my coach was also my history teacher. I spent the last couple of months of school that spring living with Mr Denton, his wife and two kids, a few miles outside of town where the wind seemed nearly always on. My mom and step-dad had moved to Colorado Springs for a new job, but didn’t want to take me out of school. I remember having elk steak, going to the Southern Baptist church on Sundays and helping with finish work on Rodeo belt buckles. I learned to rope hay bales in anticipation of roping calfs sometime and I burned the crap out of my index finger and thumb grabbing a hot muffler off of a lawn mower or splitter. Mr Denton had a side business making custom order belt buckles. He was actually quite an artist, quintessential cowboy painter. 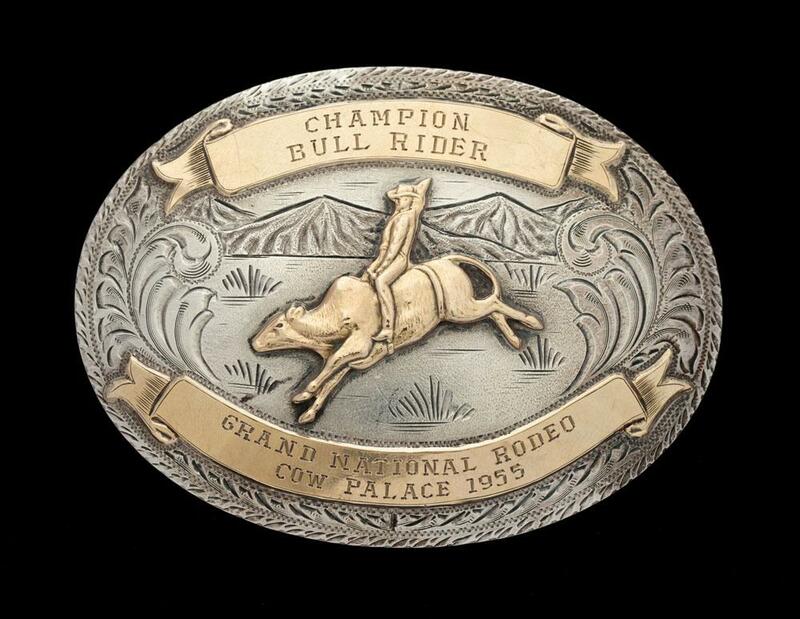 His buckles were sought after far and wide, which meant lots of finish work on buckles. In total I probably did less than 8 hours in those weeks, but it was memorable in that I saw real craftsmanship on display, and man I wanted a buckle! Thing is, you gotta earn a buckle. His kids had a slew of buckles for barrel riding, roping, etc, I’m sure. He didn’t offer and passed before I could order one as an adult. I still want a buckle. Cowboy Legend Jim Shoulders Championship buckle is amazing. Don’t know the artist, but Mr Denton was on par I know. I have written a bunch of stuff over the last 10 years or so, this is an archive post – a combination of two articles from PezCyclingNews (1, 2) a few years back. Interesting to see some of the current iterations of training metrics and analysis options coming on line. Analysis stuff like INSCYD and WKO4, Best Bike Split, etc…then mix in the rise of aerodynamics/biomechanics on the fly and more telemetry to boot! This looks at some of the science behind the terminology and factors influencing “fatigue”. Lactate and Lactic Acid production are routinely offered as the seemingly natural cause and effect parameters that cause fatigue and decrease in performance, but are they really the source of the problem? Lactic Acid was first isolated by Swedish researcher Carl Wilhelm Scheel from a batch of sour milk in 1780 (hence the commonly used term “lactic” instead of the far sexier formal name of 2-hydroxypropanoic acid, but I digress). Otto Meyerhoff and Archibald Hill, Nobel Prize winners in 1922, demonstrated that Lactic Acid was actually produced as a side reaction of Glycolysis, a primary metabolic pathway that converts carbohydrate/glucose into pyruvate, in the process converting energy into ATP through a 10-step set of reactions. In the absence of oxygen this conversion is sustained with Lactic Acid. This anaerobic process releases a proton (H+). This was a key finding as it seemed to offer a cause and effect relationship between lactate production (lactate is, essentially, the salt or base of Lactic Acid) and the extended concept of Lactic Acidosis, or a decrease in pH that results from the release of protons in the system (cell or bloodstream). This cause and effect relationship was taken as fact by researchers throughout the 20th and into the 21st century. However, in reviewing past and current research, Robergs et al (2004) have shown that there was no actual empirical evidence to support the cause/effect relationship; rather it was largely based on statistical correlation and the reputation of the Nobel Laureates Meyerhoff and Hill (which was richly deserved, I might add). So, if the cause and effect nature of lactate production and acidosis is not an accurate portrayal of the role of Lactate in the onset of acidosis, and therefore performance, what is? In 2004 Roberg, et al wrote an extensive review of the literature that sought to debunk the long-standing cause and effect relationship between lactate production and metabolic acidosis. Their sixteen page review takes an exhaustive, and somewhat intimidating, look at the true biochemistry of metabolic acidosis. For example they detail the role of the phosphagen, glycolytic and mitochondrial systems in producing ATP and the differences in how each manages any released protons. They also note the difference in the nature of the proton release in glycolysis depending on whether the carbohydrate was derived from blood glucose or muscle glycogen. Glycogen is less acidifying to muscle during intense exercise. Roberg then goes on to detail the many benefits derived from lactate production including the alkalizing effect of LDH, Lactate Dehydrogenase, or that it then circulates away the lactate to other areas that need it including the kidney, liver, and heart, for use as a substrate. Finally, they looked at the role of nonmitochondrial ATP production, via research by Gevers in 1977 and 1979. Gevers established that metabolic processes other than LDH might contribute to the removal of protons in the form of the turnover of ATP via glycolysis. In other words that non-mitochondrial ATP production was likely responsible for metabolic acidosis. Lactate threshold based training is a great tool. More specifically using the combination of a powermeter and a threshold based training approach is a highly effective way to manage your training. Coggan also noted that it has been shown in a wide array of studies that many other factors and processes contribute to fatigue. Things like epinephrine/norepineprine (adrenaline/noradrenalin), plasma potassium, and cortisol level, etc. often show a similar threshold type profile to that of lactate. Abiss and Laursen did a comprehensive look at fatigue in 2005. 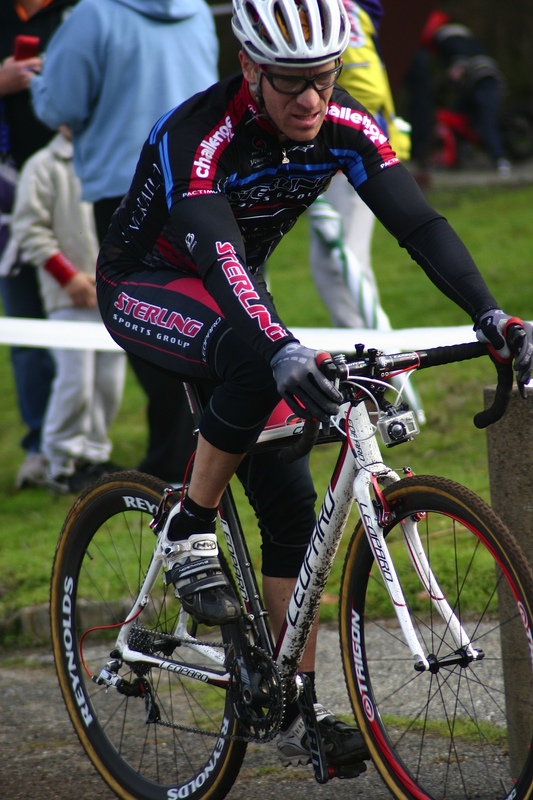 Models to Explain Fatigue During Prolonged Endurance Cycling looked at no fewer than 10 different models of fatigue including the cardiovascular/anaerobic model, neuromuscular biomechanical, thermoregulatory models, and several others. Their net conclusion is that any number of systems may contribute to fatigue in a specific way for a specific situation, but in general the limitation of the system is derived from oxygen delivery to the muscles. Since we established above that metabolic acidosis is not derived from lactic acid, but that lactate production is an important contributor to oxygen delivery, it time to embrace those burning quads and get to work improving that lactate tolerance. Last month we looked at the intricacies of Lactic Acid/Lactate production and its role in limiting performance. The short summary of that article is to say that Lactic Acid production is NOT the limiter in high intensity exercise, and the science behind that belief was founded on an inferred cause and effect relationship between lactate production and cessation of exercise that, ultimately, proved to be untrue. While lactate production may not be a limiter, it is clearly a marker of overload and does play a role in athletic development and performance. Lactate Threshold based training, when paired with use of a powermeter, is seen as the gold standard for endurance based performance improvement. So let’s explore the real meaning and value of Lactate Threshold based training. What Does Lactate Threshold Really Mean? First off, Lactate Threshold is commonly defined as “the exercise intensity at which lactate production exceeds lactate removal, and thus begins to accumulate in muscle and hence in the blood.” Unfortunately, the definition of what constitutes “Lactate Threshold” is highly variable. Many researchers establish threshold as the point when lactate concentration rises 1 mmol above an exercise baseline. Others use a fixed value, for example 2.5 mmol per liter, as the threshold point. Still another approach is to use D-max which takes the mid-point between the baseline and maximal lactate concentrations. In the end the most important consideration isn’t the way threshold was determined, so much as the concept of Lactate Threshold (and associated terms) as illustrating the non-linear relationship between lactate concentration and exercise intensity. It is also important to acknowledge that terms like Maximal Lactate Steady State (MLSS), Onset Blood Lactate Accumulation (OBLA), Ventilatory Threshold (VT), Individual Anaerobic Threshold, Critical Power, etc are talking about roughly the same range of intensity. Each of these, MLSS and OBLA in particular, correlate well with the power training concept of Functional Threshold Power (FTP), which is itself defined as your maximal sustained power output for approximately 60 minutes. Now that we have a clearer idea of what is meant by Lactate Threshold, and we know that Lactic Acid is not the cause of fatigue, let’s look at other factors that might play a role. In 2005 researchers from Edith Cowan University in Western Australia set out to do just that. Models to Explain Fatigue During Prolonged Endurance Cycling, Chris Abbiss and Paul Laursen’s comprehensive review of fatigue literature, looked at no fewer than ten different explanations of fatigue. Abiss and Laursen point out that fatigue is usually defined by the type of research being done. For example, if one is looking into psychological causes then they will tend to classify fatigue as “a sensation of tiredness,” while a biomechanist might look more at changes in force output to qualify fatigue. Fatigue research is also driven by a reductionist approach; those doing the research tend to look for a single ‘answer’ to the question of fatigue. Neuromuscular fatigue tends to be divided into a question of where along the neuromuscular pathway inhibition occurs, while the muscle trauma model seeks to explain fatigue as coming from damage to the muscle itself, or to alterations in the chemical homeostasis. The biomechanical paradigm seeks to define fatigue as the result of decreased efficiency of motion, where increasing efficiency lowers the production of metabolites (like lactate) and energy consumption, helping attenuate increases in core temperature. This segues nicely into the thermoregulatory model which looks at the role of core temperature and the increased demands on the physiological systems brought about as a result of increased core temperature towards critical points at which exercise capacity is reduced or terminated. While psychologically no single variable appears to be responsible for motor output alteration due to afferent (outgoing) signals, it is thought that numerous mechanisms are responsible for the subconscious perception of fatigue and alterations in central activation and perceived exertion. The central governor and complex systems theories seek to explain fatigue as a function of oversight by an as-yet-undefined central mechanism, or through the complex inter-relationship of multiple feedback loops seeking to maintain homeostasis, respectively. Their net conclusion is that any number of systems may contribute to fatigue in a specific way for a specific situation, but in general the limitation of the system is derived from oxygen delivery to the muscles, especially at high intensity. To further clarify in the Abiss and Laursen article fatigue was defined as “tiredness and associated decrements in muscular performance and function.” This is an important point as much research has looked at performance to exhaustion. The relevance comes when we look at how to best apply some of the factors above into the creation of a responsible training program. Many of the changes we seek are built around the optimization of oxygen delivery and increasing metabolic efficiency during the training year, so how does Lactate Threshold help? An individual’s Lactate Threshold is the single most important physiological determinant of endurance exercise performance. It is trainable, reliable, and a sort of proxy for other important metabolic processes that underlie performance. For example hormone production, like epinephrine/norepinephrine, shows a similar curvelinear relationship with increasing exercise intensity. Plasma potassium concentration, catecholamine concentration, plasma ammonia concentrations, growth hormone, cortisol and many other elements also demonstrate the same threshold type trends as lactate. Now that we’ve established what Lactate Threshold is, how it is determined, and what processes it parallels, let’s spend a little bit of time on what advantages threshold level training can bring to your performance. For untrained athletes the Lactate Threshold benefits of training can be seen at a wide range of intensities. 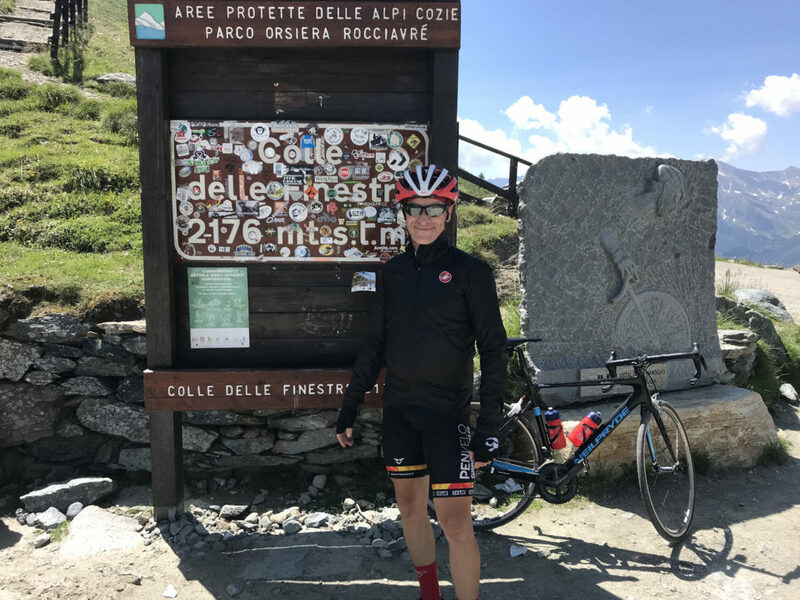 Simply getting on the bike regularly will bring about many changes including increased mitochondrial density, blood lactate response, and reductions in lactate concentration at a given intensity. For the trained athlete however, continuous training at intensities around Lactate Threshold has been shown to be beneficial since the time of the fabled East German sports machine in the twentieth century. The East Germans were famous for doing extended hours of training at OBLA! In a similar vein, Gorostiaga et al in 1991 compared a continuous training group at circa-threshold intensity to one that did only structured high intensity VO2max type intervals (of the type that are all the rage today) and found some compelling differences. While the VO2max group did show a two fold increase in percentage change in VO2max (16% increase v 8% increase), the continuous training group had a ten fold increase in citrate synthase production compared to the VO2max group (25% increase v 2.5% increase). Citrate synthase is one of the main markers for muscle mitochondrial capacity, and is a good reference for total metabolic efficiency. Both of these examples (the first decidedly anecdotal) serve to illustrate the value of continuous training at an intensity around Lactate Threshold. This has most recently been termed ‘sweet spot’ training, but the idea has been advocated by Lydiard, Coggan, and others in various forms or years. Typically “sweet spot” is defined as approximately 88-93% of your Lactate Threshold power, however the true measure of intensity should be determined by your ability to repeat them over multiple days in a training block. I always love November 1st! Mostly because it is the month of my birthday, but also because it represents the start of the “real” cyclocross season. September seems far too early to do ‘cross and October is more of a transition month, meteorologically speaking, but November…now that’s the start of some ‘cross racing weather! It is also the time of base rides with friends – and no these two do not have to be divergent in goal, it just depends on what priority you put on either. I’m torn because I like base rides almost as much as I like ‘cross. To be honest, this year I’m a bit more excited about the base rides. We have a team endurance ride this Sunday. 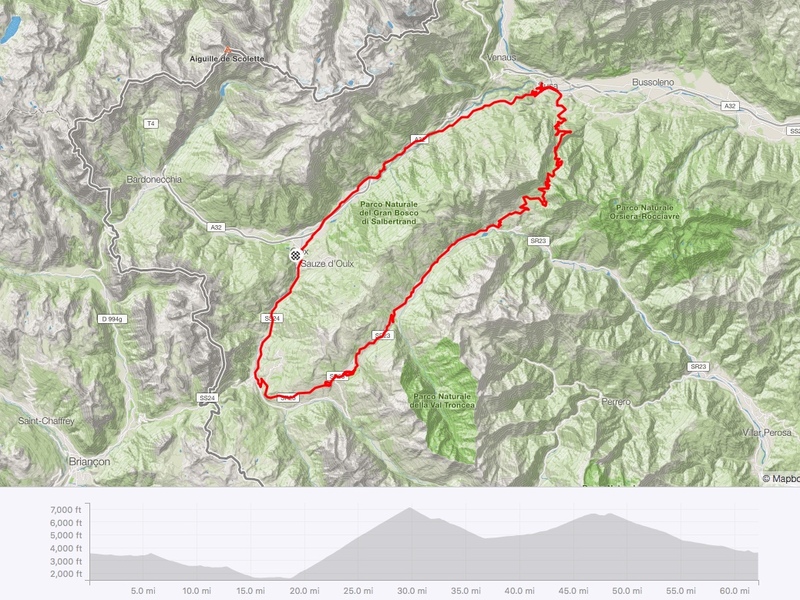 I don’t have a route planned yet, but I’m sure it will include many thousands of feet of climbing and a “tempo” pace that will, inevitably, cause much suffering in the last hour. That is comes on the heels of my favorite local ‘cross race is just a bigger bonus! Coyote Point has been the defacto “end of the season” race here in NorCal for much of the past decade. There are races after it, Districts and Nationals often, but it’s traditional slot on the first weekend of December always felt like the end of the “real” cross season. This year it’s about a month earlier..and ironically, for me it represents the real start of the ‘cross season. Yea, I should have trained more, I know. Anyway…It’s a great cross course, sitting next to the gently lapping waters of San Francisco bay and along the flight path of jets coming into SFO. I love it because it’s almost always cold and often wet…which it’s projected to be this weekend too, and I can’t wait. November is also the month this site launches. The old SterlingWins has been around since 2004 and I am so appreciative of the hard work and design offered by an old client and web developer…but the time has come to update, or perhaps downgrade is a better word. The new site is “less” than the old one. Fewer pages, less content, but perhaps a bit more relevant to what Sterling actually does; help athletes get better! I look forward to sharing my vision of what that means on this page and on the site. Hope you’ll check back from time to time..